« Is the Forest Service Requiring Permits for Photography? Yes and No. SACRAMENTO – Governor Jerry Brown signed Senate Bill 1281 by Senator Fran Pavley (D-Agoura Hills) on Thursday to require greater disclosure of water use in oil production. Oil well operators use large amounts of water in processes such as water flooding, steam flooding and steam injection, which are designed to increase the flow of thicker oil from the ground. In 2013, these enhanced oil recovery operations used more than 80 billion gallons of water in California, the equivalent amount used by about 500,000 households and more than 800 times the amount used for hydraulic fracturing (“fracking”). Oil well operators have an available source of recycled water known as “produced water,” which is trapped deep underground and often comes to the surface during oil production. More than 130 billion gallons of produced water surfaced during oil production in California last year. Many oil companies already recycle some of their produced water, but the amount is not known because of the lack of disclosure. Senate Bill 1281 requires oil well operators to report the amount and source of their water, including information on their use of recycled water. The ONLY reason for such disclosure is because they want to impose some sort of autocratic command and control rules on oil industry water use -- not water quality mind you, but the amount of water they use. Add this to all the other creepy Cuba-style water actions, like having neighbors spy on each other to monitor water use, and you will understand why folks like Milton Friedman argued that free markets were essential to free societies. 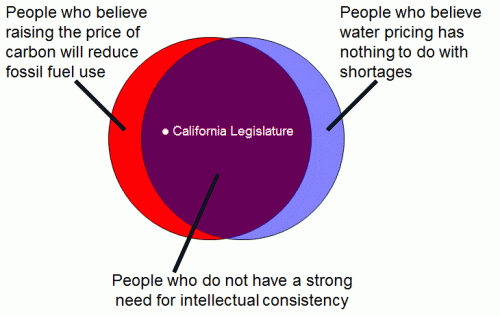 In honor of the California water situation, I have created the second in my series of Venn diagram on economic beliefs. "reducing California water use in a drought"
Anyone who says anything like this should be whacked with a clue stick. The most populous areas of CA are officially desert and the local water supply would be inadequate even in abnormally wet years. Federal water projects bring CA water from as far away as Colorado. They'd love to build a pipeline to the Great Lakes. All that extra water, just going to waste. Actually, Columbus, Ohio, has already bumped up against the limits of its water sources, and Lake Erie is off-limits because it would constitute an inter-basin transfer, which is illegal by treaty with Canada. There was something called the North American Water Plan, which proposed that water be transferred from the big rivers in the British Columbia, Oregon and Washington to California. Never got off the ground. Would have made the California Water Plan look tiny. And then there are the economists who argue that all irrigated agriculture in the Southwest be shutdown, and that water freed up be used in industry, a higher value use. Some western states use Spanish appropriation doctrine for their water supplies. Under this scheme, users are somehow ranked and assigned a fixed amount of water. The top ranked user can take his full allotment regardless of the water flow and regardless of impacts on lower ranked users. And so on down the line. Most of these states assign the highest rank to municipalities. Does California follow appropriation doctrine or riparian doctrine like the eastern states? But they would not want to pay the costs of pumping it over the Rockies. Of course not, they would expect federal tax payers to cover that cost as they do for the existing water projects. The Feds charge CA somewhere around 10% of the actual cost of the out of state water that they are already getting. Fortunately, a treaty with Canada prohibits moving Great Lakes water out of the Great Lakes drainage basin. Looks like it might be time to switch to super critical CO2 extraction. Might even get a few carbon sequestration credits. Surprised this government honors such a thing. The short story is California farmers use the bulk of water, often flooding rice fields. As usual, rural America is subsidized. But the lakes are filling-up. I can't find the story, but it is already causing erosion problems. This headline could be applied to most management, public or private. Just change water to say... campgrounds. The vast majority of water used for oil operations is not potable. Moreover..it's so salty/brackish it kills (over time) any plant life it touches. That type of water (for waterfloods) is typically drawn from deep water source wells that are isolated (via layers of casing) and hundreds of feet removed from "good water." This sounds like a "tax"on oil and a misguided economics twofer. California has a bizarre mixed water law system. 1) Prior appropriation, 2) riparian, and 3) state water board created rights all live side-by-side. Groundwater is a free-for-all that is largely unmonitored and unregulated. 40 cubic miles have been depleted so far and no one is paying much attention. Over-appropriated is probably the best summary. I'm not sure what Coyote is suggesting, but monitoring is pretty intrinsic to any market economy no matter what the resource. For example, water transfers typically bypass large numbers of riparian rights holders before they get to their intended users, but there is no online clearinghouse telling farmers what percentage of the rive is transfer and what percentage is "natural flow" to which they have a right. Monitoring makes perfect sense. You're forgetting that 50-70% of urban use in SoCal is on lawns, so "reducing use" means dead lawns. It's even possible (I've done back of envelopes) that SoCal could "live" without imported water. The Great Lakes undergo long term cycles in water levels. During the 1970's, the water level in Lake Erie was especially high, and there was severe beach erosion, worse than now. Out-of-basin water transfers from the Great Lakes is generally prohibited by treaty and law, except for the Chicago River transfers the remove Chicago's treated waste water. If transfers were permitted, it would be a simple matter to pump Lake Erie water up a slight gradient some 50 miles to the headwaters of the Scioto River, which provides is part of Columbus' water supply. I like to call this the Lake Erie Water Plan.